My name is Johanna Nygren and I come from Sweden. I am a professional trainer and rider. I graduated from Agriculture University in Hippology and passed Stable manager exam from the national stud in Sweden as well as Level 3 instructor examination from Swedish federation, judge in working equitation, educate instructors in working equitation. Since I was a teenager I have been working with horses at riding clubs as an instructor and a rider in other European countries. Also I work as a stable manager. Choosing this profession means choosing a way of life. Where you work hard and your path is lighted by the love for horses. Now I own and manage a riding school with classes in dressage and working equitation. 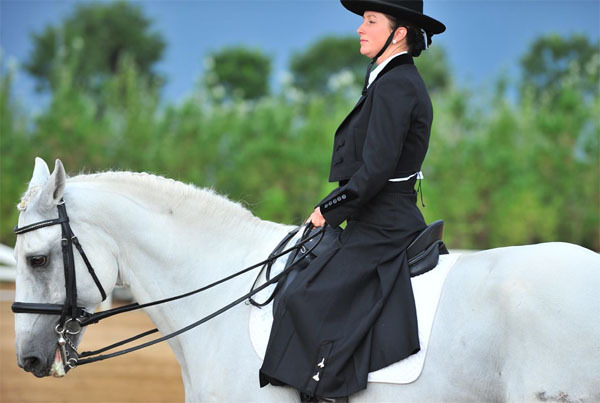 The horses are all Lusitanos from Portugal or Spanish horses educated to a high level exercise, such as doing piruette, piaff, passage and flying changes. In this way, the students can develop their riding to a higher level and get to learn the feeling from an educated schoolmaster horse. And horse owners leave their horses to me for training. How did I come to China? Mr. Joao Lynce, who is my trainer, asked me if I would like to visit China. Of course I could not say no to such an offer. And I am so glad that I came. This is such an inspiring journey. Here at the Brother Fortune Ranch there is a positive and international feeling. The whole environment here is wonderful and relaxing with beautiful architecture and very good training facilities. Staying in the hotel is a pure pleasure for its beautiful art and fine food. After we have been away to another town or place, when we returned we would always say, “We’re back home to the ranch..” Here horse cultures from the whole world meet. It is so interesting to talk to riders and trainers from different parts of the world. Through my time here I have had many inspiring discussions about the art of training and riding horses. Learning something new every day is fantastic. I was invited here to ride in the parades, which has taken me to the cities of Ordos and Dalate. I must say that Ordos did surprise me quite a lot. Riding through this new city was a thrilling experience. A city is made for parades with impressive buildings. I have traveled over many continents, but never seen anything like this. This could only happen in a country in very strong development, where people look to the future with great confidence and trust. We had the pleasure to do a show in Dalate, which turned out an extraordinary experience. My impression is that it is a very clean and organized city. For having so many inhabitants, you still get the feeling of a comforting town with a nice personality. You feel safe and have great shopping! And riding the parade there was a memory for lifetime. I could never imagine how many people would follow our way through the city. I was smiling all the way. All these friendly smiles on all the spectators’ faces were totally amazing. I felt like the whole of china was smiling and waving at me. Everyone was so curious and friendly. This is my first visit to China. But I really hope it not is my last.